I’m really excited to announce our continued partnership with Greenbar Distillery in Los Angeles, CA. When I met Melkon Khosrovian and Litty Mathew, Greenbar Distillery Founders and Spirit Makers, I immediately saw the passion they had for Los Angeles. They wanted to make a difference in their community just as I did. It was a perfect match and I’m excited for our partnership together. For the month of September 2018, Greenbar Distillery has partnered with The Burrito Project to give out 50,000 burritos. They have generously put together a promotion which creates a win-win. 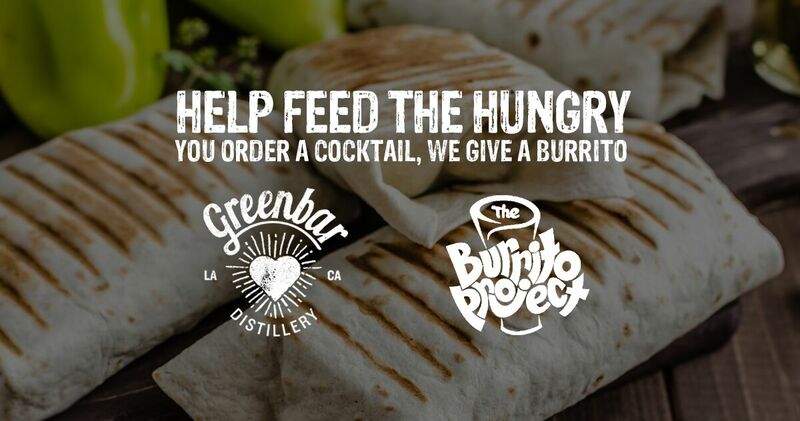 You can read about The Burrito Project & Greenbar Distillery Fall Promotion here. In a nutshell, when you visit one of the many participating SoCal Bars and Restaurants and order a brand new CITY gin cocktail, Greenbar Distillery will donate a burrito to help feed the hungry in Los Angeles, Orange County, San Diego, Sacramento, San Francisco & Oakland. If you’re a restaurant or bar who wants to join this September Promotion and be added to the list of supporters, contact me and I can help you get involved. Any purchase in September will help create burritos for the hungry, so it’s never too late to join. If you’re interested in purchasing a bottle of their spirits, Greenbar Distillery donates a tree for every bottle sold. They donate trees and burritos! Thank you, Greenbar! PS – Greenbar Distillery helps support the burrito projects in the following cities. Please join us Join us and help us make burritos! Sacramento – Coming soon in 2019!